Please join us in exploring the growth and impact of Impressionism and especially Impressionist printmaking on artists working in France during the late 19th and early 20th-century. It also explores the various directions taken after the Impressionist revolution by those interested in exploring other dimensions, including the Nabis (Bonnard, Denis, Roussel, Toulouse-Lautrec, and Vuillard), Fauves (such as Matisse, Vlaminck, and Derain), and the practitioners of Cubism (especially Picasso and Braque), Dada (Arp, Duchamp), Surrealism (Chagall, Miró), and Expressionism (Rouault). We will also explore the growing interest sparked by the Impressionists and the German Expressionists in various ways of producing color prints. Among the many new additions to our inventory since our last show of Impressionist and post-Impressionist works, we note seven drawings by Jean-Louis Forain, drawings by Luce, Cross, and Marie Laurencin, two hand-colored drypoints by Mary Cassatt, and two etchings by Marc Chagall with hand-painting by Chagall. Also of interest, a group of five early etchings by Vlaminck, seven Derain lithographic figure studies, most of which came from the publisher’s estate, a very early self-portrait by Degas, what is probably Renoir’s first etching, several new Cassatt drypoints, and a beautiful Suzanne Valadon etching. Although artists have dreamed of color prints since the fifteenth-century, for the most part, it was not until the twentieth-century that artists became personally involved in colored printing processes. To be sure, the chiaroscuro woodcut was developed in the sixteenth-century and permitted the production of differently toned prints. To be sure, artists (including Blake and Degas) experimented with hand-colored prints from the fifteenth-century to the present. Nonetheless, in the first half of the twentieth century, color printing by artists involved either printing in monocolor but using different colors of ink or paper for part of the edition or of producing pochoirs (stencil prints), using lead stencils and (for the most part) employing assistants to brush color onto the printed paper thus producing works with the look and feel of watercolors or gouaches rather than prints. If more elaborate color were required, etchings could be printed à la poupée, where the artist designed a work in which the plate could be inked with different colors in discrete areas and run through the press once, or lithographs (and sometimes aquatints) could be produced in collaboration with a master printer, where the artist drew the black stone and the master printer, working under the artist’s supervision, produced the various stones to be printed in the various colors (Chagall and Rouault frequently worked in this manner). In addition to a number of important etchings and drypoints by masters including Manet, Renoir, Mary Cassatt, Degas, Berthe Morisot, Cezanne(we will show 3 of his 5 etchings), Signac, Dufy, Matisse, Rouault, Chagall, Picasso, and lithographs by Toulouse-Lautrec, Bonnard, Renoir, Ker Roussel, our present show features a group of magnificent pochoirs done by or under the supervision of Matisse, Miró, Picasso, and Sonja Delaunay, and collaborative works between master printers and artists (including Bonnard, Braque, Picasso, and Matisse working with Fernand Mourlot and Vlaminck with Charles Sorlier). Visiting hours: Saturdays and Sundays 12:006:00 and weekdays by appointment. Although zoning regulations require us to request telephone confirmation (@ 800-809-3343) of your visit, browsers and guests are always welcome. Paul Gauguin was one of the most important Post-Impressionist painters and printmakers, but his impact on later artists includes the mythology that grew up about him: his abandonment of a job as a successful stockbroker, his abandonment of wife and family, and, ultimately "civilization" itself in search of a truth in nature that he found lacking in a civilization that he felt had become diseased. His adoption of a "primitive" lifestyle and his incorporation of motifs from native art into his own paintings and woodcuts served as an inspiration both to the Fauves and the German Expressionists and to artists like Picasso. Print catalogues: Caroline Boyle-Turner, The Prints of the Pont-Avon School: Gauguin and His Circle in Brittany (NY: Abbeville, 1986) and Caroline Boyle-Turner, Gauguin and the School of Pont-Aven: Prints and Paintings (London: Royal Academy of Arts, 1989). La femme au figues (Guerin 88). Original etching and lavis on zinc, 1899. First published in the portfolio, Germinal in an edition of 100 impressions in greenish-gray ink. At some point after this edition, the plate was cut down on the right side from 268x444mm to 268z418mm. 10 impressions from this were printed by Madame Delatre, widow of the printer of the impressions for Germinal, who then cancelled the plate by gouging 2 crosses lower center. In 1966, the plate was purchased and perhaps as many as 1000 impressions were made from it. Our impression is a good early impression from this edition. In later impressions, much of the background hatching wears away and no longer prints; the central image also deteriorates. 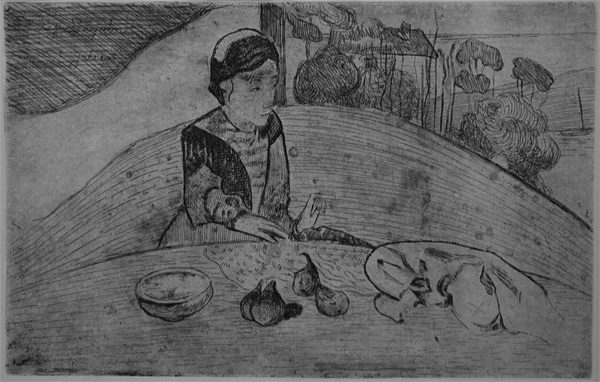 Although Guerin denied that Gauguin executed this work (noting that "Chez Seguin à St. Julien" is etched into the upper left crosshatching), more recent scholars point out that Gauguin was still alive when Germinal was first published and never disclaimed his authorship of the work. See, in particular, Caroline Boyle-Turner, The Prints of the Pont-Avon School: Gauguin and His Circle in Brittany (NY: Abbeville, 1986), G. 5b, for her judicious account of the critical debate on this work, which had been considered, according to Print Collector I (1972), 71, "one of the most meaningful engravings in contemporary French art." Image size: 265x418mm. Price: $5000. La femme au figues (G. 88). Original etching, 1899. This is a late impression of the same work. The amount of wear to the plate is immediately visible. 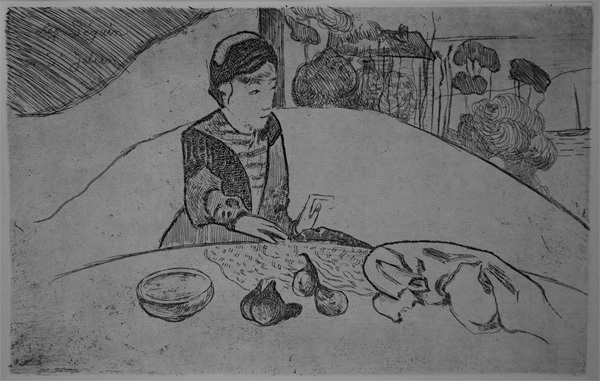 Gauguin etched the work on a zinc plate which wore very quickly. Image size: 265x414mm. Price: $1850. Spaightwood Galleries is located at 120 Main St (aka Highway 140) in Upton MA at the corner of Main St and Maple Ave in a rehabilitated Unitarian Church. For directions and visiting information, please call. We are, of course, always available over the web and by telephone (see above for contact information). Click the following for links to past shows and artists. For a visual tour of the gallery, please click here. For information about Andy Weiner and Sonja Hansard-Weiner, please click here. For a list of special offers currently available, see Specials. Visiting hours: Saturday and Sunday noon to six and other times by arrangement. Please call to confirm your visit. Browsers and guests are welcome.